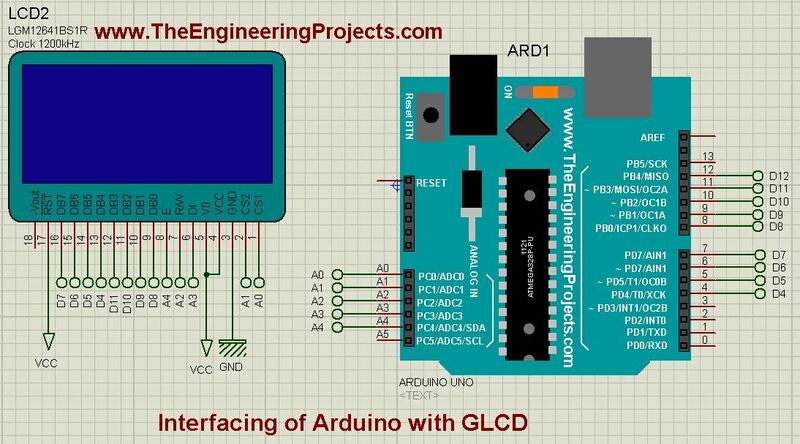 A complete step by step tutorial on Interfacing of Arduino with GLCD. Hello friends, I hope you all are doing great and having fun with your lives. 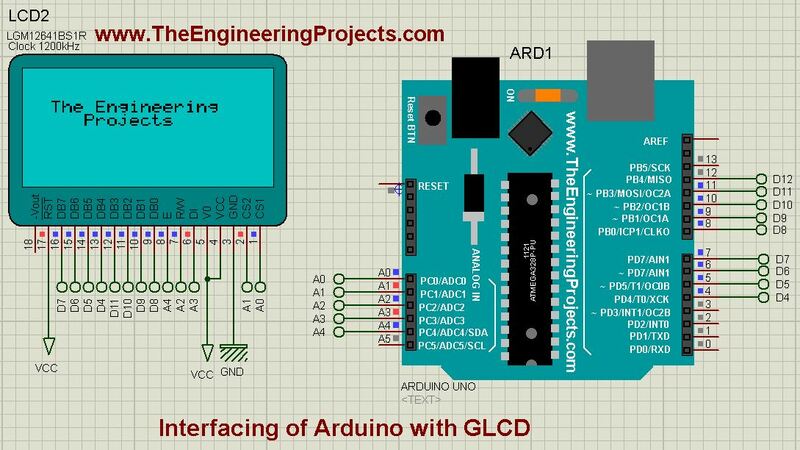 In today’s tutorial, I am going to share How to interface Arduino with GLCD. I am gonna design a Proteus Simulation in which I will interface Arduino GLCD together. GLCD is also called Graphical LCD so today we are gonna do some designing on the LCD. The GLCD I am going to use is ks0108 and its model in Proteus is LGM12641BS1R and I have shared the complete Simulation along with Arduino Code below for download. But I would suggest you to design it on your own so that you could get the most out of it. If you haven’t worked on the LCD before then I would suggest you to read How to Interface Simple LCD with Arduino. Moreover, I am quite happy to announce that we have started TEP Forum so if you guys have any questions related to your engineering projects then ask in our forum and we will try our best to resolve your issues. Anyways, let’s get back to our today’s tutorial and interface Arduino GLCD in Proteus ISIS. Now let’s design it so that you can understand how this is working. Proteus doesn’t have Arduino in its database so you need to install this Arduino Library for Proteus if you wanna use Arduino in Proteus. Now upload the below Arduino code in your Arduino Software and Get your Arduino Hex File, which we are gonna upload in our Proteus Arduino. You also have to install the GLCD Library for Arduino, I have added this library in the above package so when you download it first of all install this library in Arduino Software. So, what we have done is we just printed our blog name on the GLCD using Arduino. Now, in the package you download I have also added another example which when you upload will give you a demo of GLCD. 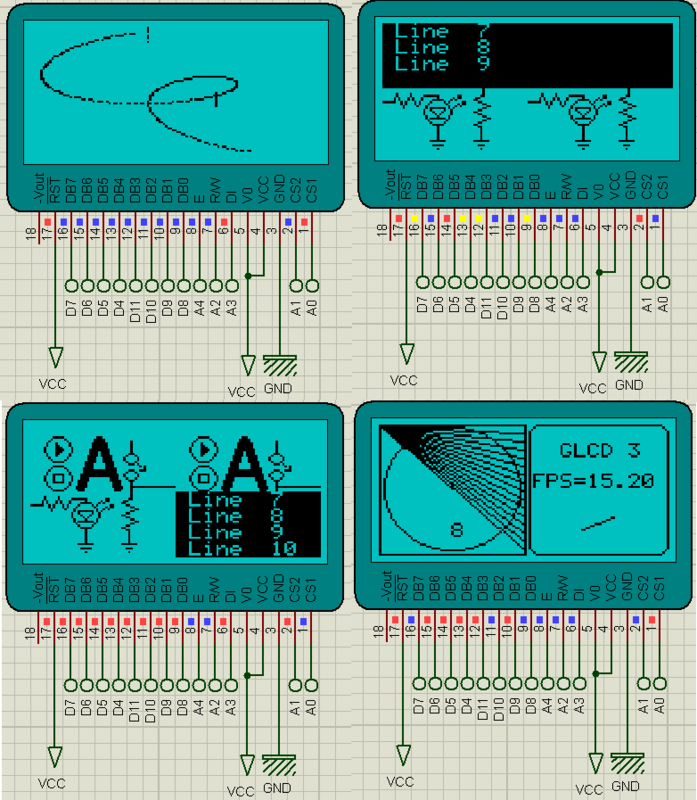 So, that’s how you can interface Arduino with GLCD and can design anything you want. It’s really very easy but quite lengthy, I must tell. I have simulated it but the GLCD displays dots and it does not display the string also.The proteus also give error of “Proteus has stopped working” and “Logic Contention Warnings” when using Arduino Uno Board in simulations.What can be the problem in my design and why the GLCD gives dots and Proteus gives error ? Also it does not gives error when simulating it without Arduino Board. Hello , Firsly ı would like to thanks you for this tutorial. I have to do final project with my friends and we should plotting to some graphichs on the LcD by using Arduıno mega.Can we use that glcd that you mention above?Will it be enough for us ? As quickly as ı am waiting your helps.Thank you!